The latest comic-related blow-up seems to be that Quvenzhané Wallis has been cast in the role of Little Orphan Annie for a new movie remaking a 1999 movie that itself was a remake of a 1982 movie that was based off a 1977 Broadway musical that was loosely based on a comic strip that debuted in 1924. (And that doesn't even factor in the other movies and radio shows.) To no one's surprise, any number of people have started clamoring about how Annie is supposed to be white, and casting a Black girl in that role is just plain wrong. Of course, whether or not the comic strip that debuted the character is even running any more doesn't come up at all (it ended in 2010) but that's another issue. This is the same "discussion" we had a few weeks back when we learned Michael B. Jordan was tapped to play the Human Torch. I use "discussion" in quotes, of course, because no one who steps into the argument really seems to be listening to anyone else; one group is just ranting about how Wallis can't play a character that was originally drawn as white, and the other is calling the first group of people racist assholes. Let's step back a moment, though. We're talking about Little Orphan Annie. Although they only represent 14% of the general US child population, Black children make up 28% of those in foster care. In states like Maryland, that number is upwards of 65%. What that means is that if you're Black, you're statistically more likely to be (or become) an orphan than if you're white. Being a Black orphan is a radically different experience than being a white orphan; there's a much smaller number of adults willing to adopt Black children and the likelihood of staying an orphan is greater. Yet this has never really been reflected in pop culture, so telling the story of a Black orphan is then arguably more important than telling the story of a white orphan. The producers of the movie recognized this early on, as Willow Smith was originally tied to the lead role as early as January 2011. So if you're going to cast Annie as a Black girl (which, let me reiterate, makes more sense statistically and is an inherently more powerful story) it quickly becomes problematic to cast Daddy Warbucks as white. What you absolutely don't want to suggest is that a young Black girl's "rescue" comes at the hands of a white man. Even though Annie historically has her own agency in the story, putting that shadow of a white savior story element in place is precisely the type of racism we're trying to battle in this country. Which gives us two Black lead characters in a musical traditionally cast with white people. You know what this reminds me of? The Wiz. It was a retelling of the Wizard of Oz movie but featuring an all-Black cast and reflecting the themes of then-contemporary late 1970s Black culture. (Interestingly, this was also a movie based on a stage production based on a movie based on a book.) Dorothy Gale, the prototypical white Kansas farm girl, was played by Diana Ross. Kansas is replaced with Harlem. The Emerald City becomes the World Trade Center plaza. It's the same story as the Judy Garland movie, but since so few people in 1978 were familiar with rural farm life circa 1900, the details were swapped with those that would be more identifable and relatable. Pretty diverse group of kids there with lots of different ethnicities represented. It's a cast that reflects what we see on the streets every day. What I'm trying to say here is that, not only is casting Wallis as Annie not a bad thing, but I'd argue that it's almost necessary in order to tell a contemporary version of the story. The character's race was never a defining characteristic; it was just that, in 1924, Black children weren't considered valuable enough to even try to adopt so orphans were just abandoned entirely and never even made it to an orphanage. But nearly a century later, they compromise a disproportionate number in the system and it absolutely makes sense that the story of a modern orphan should be one of a Black girl. And one depicted by someone as talented as Wallis should make for an excellent movie. I was more surprised that "Daddy" Warbucks (now Benjamin Stacks) wasn't a bald, middle-aged, altrusitic billionare, but a young opportunist millionare with a full head of hair, and that Miss Hannigan had been toned down. (Someone with Laurence Fishburne's gravitas could've done a helluva job in the Warbucks role if done closer to the original. Plus, we could've had his wife, Gina Torres, as either Miss Hannigan or Grace Farrell! 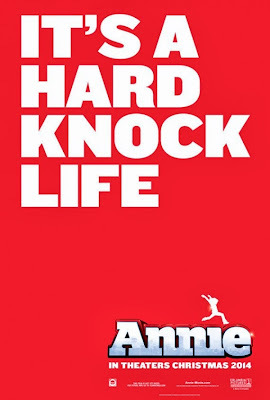 Wouldn't most of Annie's appearances, and certainly the early ones, have been black and white?